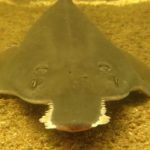 Global Travel Media » Blog Archive » Have you seen a sawfish? “Your sightings, no matter how long ago they happened, will help us work out how many sawfish there used to be, how many remain, and how we can help them recover,” says Dr Barbara Wueringer, a zoologist and the director of Sharks and Rays Australia (SARA). Forty years ago, sawfish were regularly seen off Sydney and the east coast, and Perth and up the west coast. Today they’re rarely seen outside of the Gulf of Carpentaria, NT and the Kimberley. Sawfish can grow to six metres with saws as long as two metres. The saw can detect the electrical impulses of fish. Then with one slash it can cut smaller fish in half. It’s so streamlined that many prey fish may not detect it. But the saw gets caught in nets, and in the past it was a prized fishing trophy. “For four out of five species, the waters of Northern Australia may contain their last populations. As sawfish are slowly retreating to remote parts of the continent it’s critical that we find out what’s out there, and how we can help them,” says Barbara. Barbara is leading an investigation in Queensland to identify where sawfish still occur and in what numbers. “We’re working with local Indigenous Ranger groups, fishers, and landowners, and with scientists from around the world. SARA is based in Cairns. 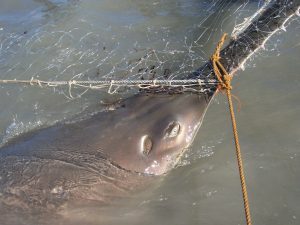 Their research is supported by the Save Our Seas Foundation (based in Geneva) and the US-based Shark Conservation Fund. All sightings generated by the project will be shared with Team Sawfish at Murdoch University, WA and sawfish researchers from Charles Darwin University, NT.